Jordan Jones fires a pitch for Warsaw Monday night. The Tigers beat host Wawasee 13-2. 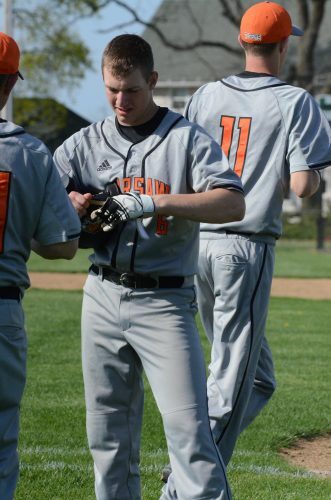 SYRACUSE – Jared Hawley set the tone from the first at-bat for the Warsaw baseball team Monday night. His teammates then made sure to follow suit. Hawley got the Tigers going in the first frame en route to a huge night at the dish in a dominating 13-2 win over host Wawasee. 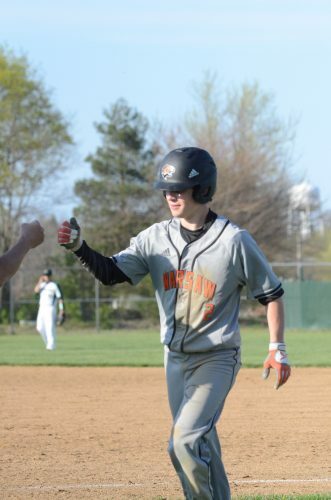 Leadoff hitter Hawley, who rapped a single to start a three-run first inning, finished the night with four hits as the Tigers rolled in the Northern Lakes Conference opener for both teams. The Tigers got big contributions from a plethora of players, but the top of their lineup was lights out versus the Warriors. Senior Alex Miller, hitting in the No. 3 hole, also cracked out four hits for Warsaw. Cleanup hitter and senior Braxton Tennant smacked three hits, including a pair of doubles, and drove in three runs for the Tigers. Warsaw coach Mike Hepler, who saw his team improve to 3-3 overall, loved the work from the top of his lineup. “The top of our order gave us good production tonight,” said Hepler. “Hawley had a fantastic night with four hits. We got timely hits and that’s what we needed. Warsaw, which shared the NLC title with Plymouth a year ago, wasted no time. Miller delivered an RBI single and senior Collin Marshall added a two-run hit in the first inning for a 3-0 lead. The Tigers made the hosts pay with an opportunistic second frame. Warsaw used two walks, two errors by the Warriors and a passed ball to plate four more runs to make it 7-0. Senior Jordan Steffensmeier drove in a run with a sacrifice fly and sophomore Liam Patton added an RBI on a groundout in the inning. Jared Hawley had a big night with four hits for Warsaw. The Warriors, who fall to 3-4, got a run in the third on an RBI single by junior Jake Crousore. Warsaw answered right back in the fourth with two more runs. Tennant crushed an RBI double and Patton delivered an RBI single to make it 9-1. The Tigers added four more runs in the seventh as junior Hawley and Miller smacked RBI singles and Tennant smoked another double to plate a pair to make it 13-2. Warsaw starter Jordan Jones went six strong innings to notch the win on the hill. The senior improves to 1-1 on the season. Tennant came on in the seventh and fanned three of the four batters that he faced. Wawasee coach Brent Doty put this one on himself after the tough night. “We didn’t have it tonight and that’s on me,” said the Warrior skipper. “It’s my job to make sure that we are ready to play. The NLC is not easy and we have a tough Memorial team coming in here Wednesday. It starts with coming back tomorrow and having a good practice. Blaine Greer led the Warriors with two hits, including a double. Rylan Kuhn had a hit and scored a run for the hosts. Starter Jacob Garcia took the loss for Wawasee. The duo of Ian Glogovsky and Matt Shoemaker both had nights to remember for the Warsaw junior varsity team. 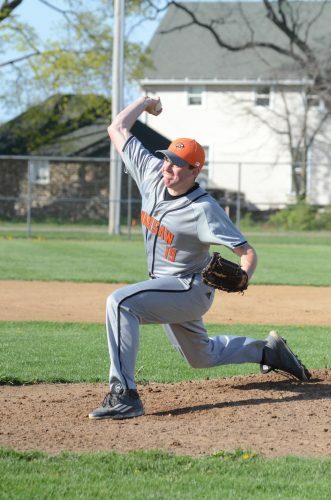 Glogovsky fired a no-hitter and Shoemaker hit for the cycle as the Tigers downed Wawasee 16-0. 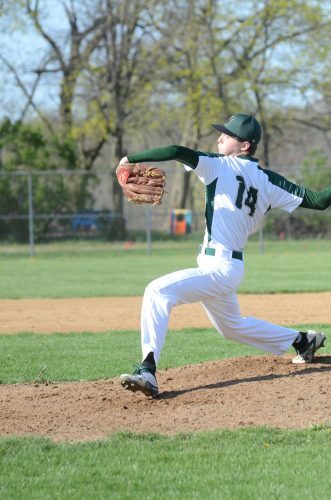 Glogovsky fanned nine and walked none in the five-inning win. Warsaw had 15 hits in the win with Shoemaker, Glogovsky, Noah Burgh, Tyler Hitchcock and Aric Krallman each having multiple hits. Warsaw hosts Goshen (7-3) and Wawasee entertains Elkhart Memorial (4-4) in NLC games Wednesday evening. Goshen lost to Northridge 5-3 and Memorial dropped a 9-4 final to Plymouth in other NLC openers Monday night. Collin Marshall of the Tigers. Josh Slabaugh delivers a pitch for the Warriors.